First published in 1963, Advances in Parasitology contains comprehensive and up-to-date reviews in all areas of interest in contemporary parasitology. 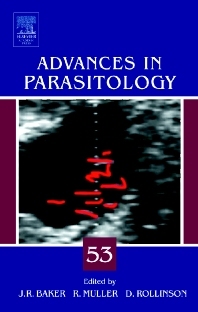 Now edited by J.R. Baker, R. Muller, and D. Rollinson, and supported by an international editorial board, Advances in Parasitology includes medical studies on parasites of major influence, such as typanosomiasis and scabies, and reviews of more traditional areas, such as zoology, taxonomy, and life history. Eclectic volumes are supplemented by thematic volumes on such topics as Remote Sensing and Geographical Information Systems in Epidemiology.